Leica announced an alternate, two-toned look for its D-Lux (Typ 109) that not only dresses the compact in two-tone gray with a gray enameled body and silver lens but extends the look to a silver CF D flash and a matching custom strap. The $1,05 D-Lux Solid Gray sports the same technical specifications as its black sibling including a fast, Leica DC Vario-Summilux 10.9-34mm f1.7-2.8 ASPH lens matched to its large four-thirds sensor. The zoom lens is equivalent to 24 to 75mm in 35mm format. The Kit. Matching flash and strap. It also captures 4K video and its integrated WiFi module allows for remote camera control and the ability to share still and moving pictures to a smartphone or tablet via the Leica Image Shuttle app for iOS or Android devices. Leica said the two-toned model will be availabe at the end of the month. For more information see the news release below. Leica Camera announces the Leica D-Lux (Typ 109) Solid Gray, a sleek and stylish new version of the popular Leica D-Lux compact camera. 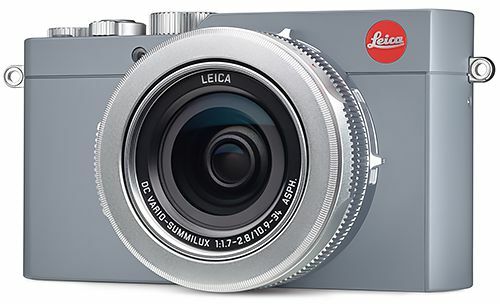 The Leica D-Lux Solid Gray is a two-toned model featuring a gray enamelled body with silver lens and control dials, giving the camera a sleek and modern look. The new version will shoot photos of the same impressive quality as the traditional Leica D-Lux (Typ 109), while also serving as an elegant and sophisticated accessory. 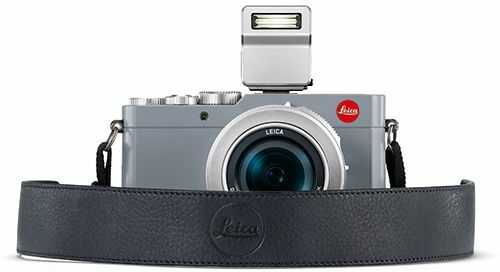 The trendy new camera will include a Leica CF D flash in silver and a custom-made camera carrying strap that's color-matched to the new model, making it a convenient and elegant companion for capturing unique moments in day-to-day life. The handcrafted leather carrying strap features custom Leica embossing and its broad form and non-slip lining make carrying the camera extra comfortable. The technical specifications are identical to those of the standard model and uphold the same extensive range of features, versatile functions and intuitive handling that Leica is known for. Among the outstanding highlights of the camera are a fast, Leica DC Vario-Summilux 10.9-34mm f1.7-2.8 ASPH lens that is ideally matched to its large four-thirds sensor, delivering exceptional imaging performance. The zoom lens, which is equivalent to 24 to 75mm in 35mm format, gives it an extremely practical range of focal lengths, making it ideal for almost all genres of photography, from portraits to landscapes, architecture to macro and the classic mainstay of Leica cameras, reportage photography. Its 4K video capability and integrated WiFi module for remote camera control give photographers further creative options, with the ability to share still and moving pictures to a smartphone or tablet. The Leica Image Shuttle app required for this function can be downloaded free of charge and installed on iOS or Android devices. The Leica D-Lux Solid Gray, priced at $1,095 will be available at the end of November at your local Leica Store, Leica Boutique or Leica dealer.